Overacting, midgets, gay cousins, gender bending, murder, rip offs, musical numbers, and more! Sometimes known as “Wow Wow What the F?”, this panel aims to entertain and educate. This is a viewing panel that shows clips from various Filipino television series and movies that have “awesomely bad” written all over it. There are plenty of genres to cover: the rip off, the bading, exploitation, shoot ’em up, and the overdramatic soaps. This panel was conceived by Eri Kagami. She grew up being subjected to the massacre genre and recalls the copious amounts of bloodshed and tears spilled in traditional Filipino overacting style. 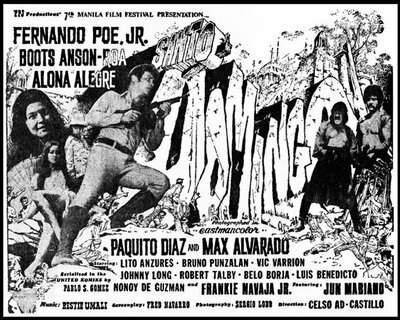 After discovering that fellow FilAms feel the same way on the over the top / go for broke style of Filipino cinema and television, she decided to gather a few friends to present this panel. It all started with “Alyas Batman en Robin,” late 80s / early 90s film of the dynamic duo that puts Joel Schumacher’s films to shame. Musical numbers, an array of familiar DC super heroes (and a special guest appearance from midget Spiderman), and witty puns. The FilAm (and friends) geek community can certainly appreciate this!